Wow! I’m impressed. I love jigsaw puzzles but I’ve never tackled one that big. I will work on one until my back hurts, though. I will work til by back aches too, but not this time. Because it was so big it was easy to pace myself. Hi! 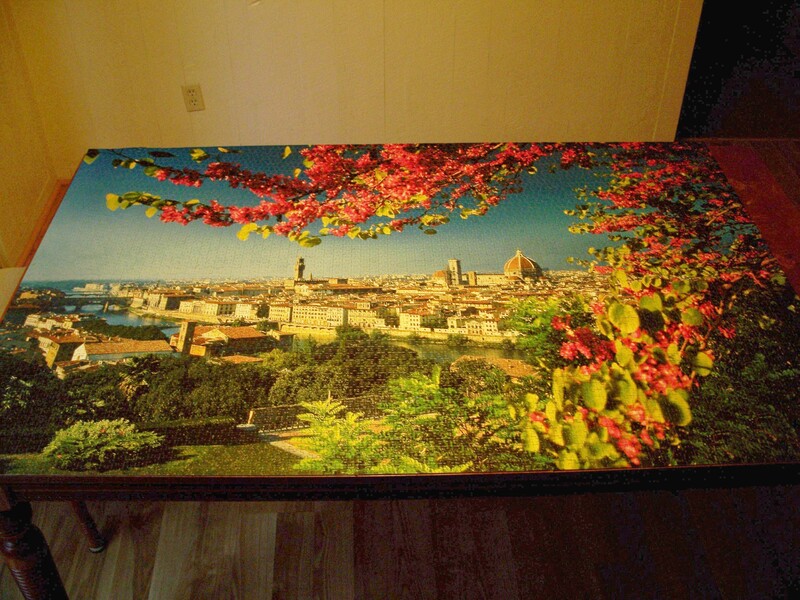 I’m not really sure how I got here here but weirdly enough I live in Florence and love jigsaw puzzles -I did a huge one (9000 pieces) in a couple of years and of course I also swore I’d never do that again. But I admit it’s quite addictive and eventually I’ll start another one soon! ;o)Ciao! Welcome! I cannot even imagine trying a 9000 piece puzzle, although when I see them I’m always tempted 🙂 Florence is a wonderful city. We were only there for 3 days, but had great adventures. Wow! The puzzle is beautiful. You have such patience and perserverance. I think my contribution was two or three pieces, but even that gave me an appreciation of how much work is involved in a 5,000 piece puzzle. Good job Stacy! It is a great looking puzzle. When I was a kid, I used to do some small ones with my dad and he always transfer them on a frame to glue them so I will have a souvenir of them. It could look nice. If I framed every puzzle the house would be wall to wall framed puzzles. Wow, I didn’t know there are such large puzzles. I am calling my 16×16 puzzle itself as “Extreme” on our website. What should I call a 5000 piece puzzle! haha. problem is they are addictive. try the 24,000 piece by Educa. Makes a great mural, and is done in 1000 piece blocks so won’t drive you insane. trouble is not your sanity but the wall space. Do not tempt me. They are too addicting. Of course, here in Cleveland we have lots of snow days…perfect for puzzling! I love puzzles and you know what I commend you for finishing that, In order to finish that you must have a lot of patience and focus. I think I am going to try 24,000 piece by Educa and try my luck or should I say patience. I cannot even imagine trying anything so large. Good luck! I love jigsaw puzzles and this one looks very nice. Recently I bought one 5000 piece puzzle, but I haven’t started it yet, because I have to finish another one made of 3000 pieces. I love this puzzle and had already done it once! Messed up the puzzle by trying to glue it onto a coffee table though! And now I am absolutely desperate to get hold of this puzzle again! Have you sold it yet? I will buy it off you and have no problem paying for shipping… Hope you still use this site! My dad was really into puzzles and I still have a few he put together and mounted. My mother’s house is full of them–I swear it’s practically the only artwork on her walls. My brother and I send puzzles back and forth to each other as challenges! Gorgeous puzzle! My parents put one together that was that large when I was a kid and they glued it together. My dad made a custom frame for it and it hung over our sofa for years. It was also a puzzle of an exotic location. 5000 pieces? Holy cow! I throw a fit about 1000. MostlyI stick to 500-750. Whatever size, they are great entertainment. And thanks for the tip on getting puzzles from ebay. I have the same puzzle in my room but never have the time (and the place) to finish it. It was big! I had to tape some cardboard around the edge of my tableto finish it!